Porcine style boxing has traditionally favored the use of really big stone dummies. TRADITIONAL TRAINING EQUIPMENT IN THE CHINESE MARTIAL ARTS (PART II): ATTACK OF THE WOODEN DUMMIES! 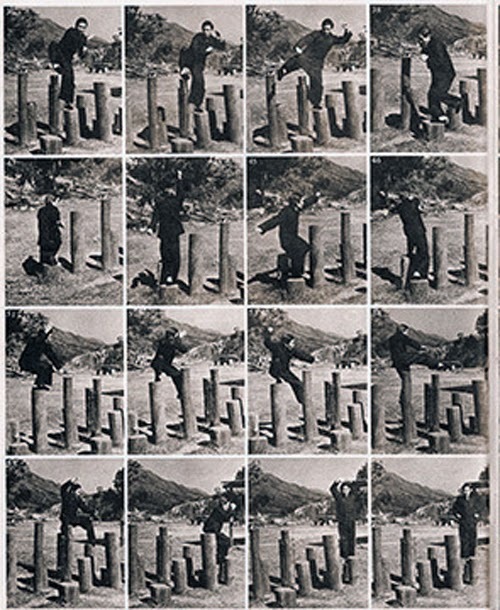 One of the most iconic images in the annals of Kung Fu training is that of the lone student, lost in the zen-like practice of his wooden dummy routine. Dummies of various sorts and sizes have a long history in Chinese boxing. 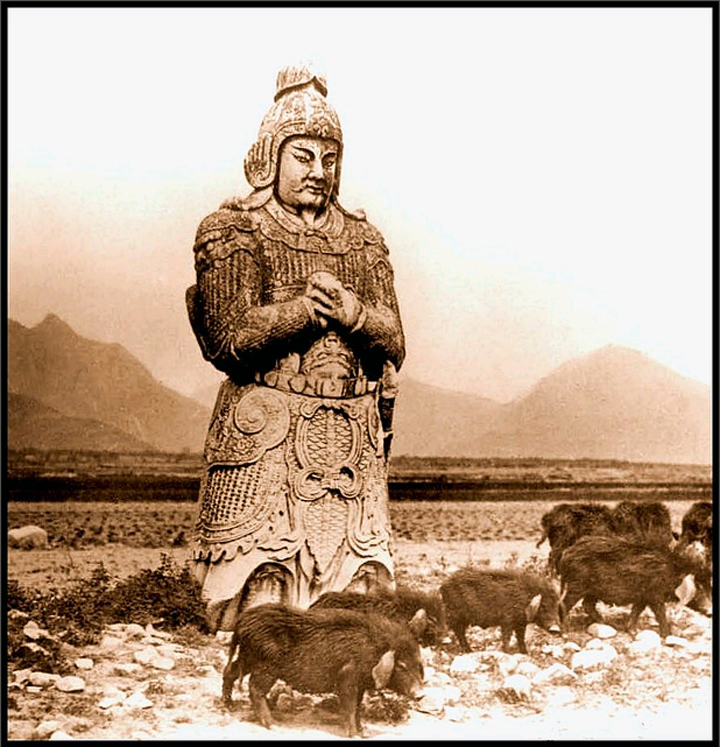 Kang, in his timeline of the development of the Chinese martial arts, notes that legends and references to their use in military training date back to the 12th century BCE (Spring and Autumn of the Chinese Martial Arts, 1995. pp. 22). In their simplest form a dummy might consist of a single living tree or planted pole which a practitioner can walk around (practicing entry), kick and strike. If one accepts trees or simple posts as dummies then they are ubiquitous throughout the Chinese martial landscape. However, legend also speaks of more sophisticated, or even diabolical, wooden combat machines. 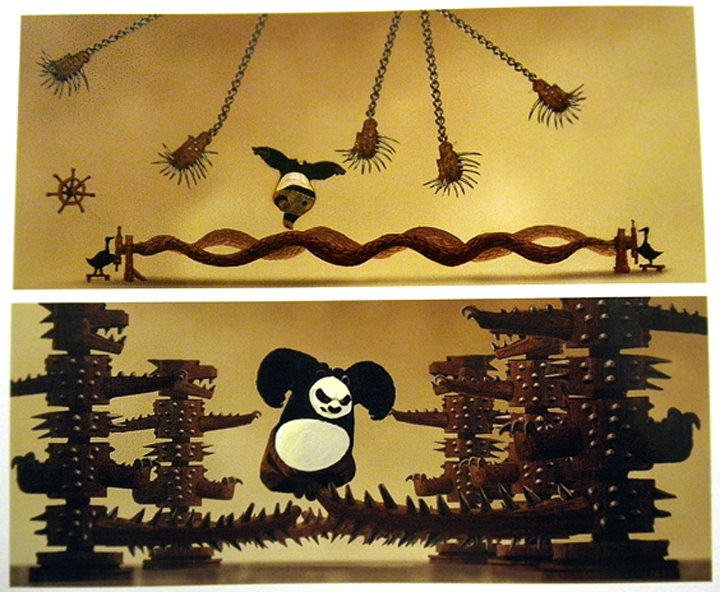 A common story (dating to the second half of the 19h century) states that the southern Shaolin temple had a hall of ingeniously designed wooden fighting machines. Rather than being totally reactive these machines could also take the offensive. One could not graduate (and leave) the temple’s training program without being able to make it across the training hall. This image of a training hall full of automated and dangerous wooden dummies lives on in modern folklore as anyone who has seen the recent children’s film Kung Fu Panda is aware. In modern times (from the middle of the 19th century on) the wooden dummy has been markedly more popular in southern, and to a lesser extent coastal eastern, China. Nor will we be surprised to learn that this is also where the legend of the Shaolin hall of the wooden dummy men first emerged (before being popularized throughout the Chinese cultural sphere—See Hamm (2005), Paper Swordsmen, chapter 1). Most of this post will focus on those areas where the greatest number and variety of dummies are found. Stepping dummies are more wide spread than their striking cousins. While not all styles use them, “plum blossom poles” are currently seen in all regions of China. They are often employed by Plum Blossom Boxers (Meihua quan) in Shandong, Henan and in the north. Additionally, they are also an absolute fixture in a number of styles in Fujian and Taiwan, as well as commonly encountered in Guangdong and Hong Kong. The wide spread adoption of this technology probably says something about its relatively ancient origins and the ease with which such training devices can be constructed. Traditionally a field of plum blossom poles (I am using the approximate English translation to avoid confusion as the Chinese name varies between dialects, regions and styles) was comprised of a group of two meter long posts, approximately 10-14 cm in width, that were set firmly halfway into the ground. The number and pattern in which these are laid out can vary quite a bit. Often in modern southern martial arts only five poles will be used, replicating the five blossom of a plum flower, but more elaborate fields of a dozen poles or more are fairly common. Additionally the height of the poles is sometimes kept even and sometimes staggered depending on the requirements of a given school. If the posts are made high enough it is not uncommon to see students also using them as a striking target (for both hands and feet) while they are standing on the ground. In fact, I have often wondered if this wasn’t the actual origin of the three posted kicking dummy seen in some Wing Chun schools today. A martial artist using a field of plum blossom poles. Different sorts of “portable poles” have been constructed over the years. Esherick (Origins of the Boxer Uprising, 1985) reports that in the late 19th century Plum Blossom Boxing instructors would travel between temple festivals and marketplaces in Northern China after the wheat harvest to demonstrate their skills, meet old friends and recruit students (pp. 148-149). Small benches, pots and other mundane objects were occasionally employed in these demonstrations of martial and acrobatic prowess. Training on the plum blossom poles is still common today in a variety of schools. It has a number of benefits but the most obvious are better balance and greater precision in stepping and turning. Working on the poles can also build leg and core strength. Striking dummies are also seen in the north, but probably less frequently than the plum blossom poles. Certain Bagua schools for instance will walk circles around a tree that might occasionally be struck. Others have been seen using a single planted pole for similar purposes. Some of these practices even resemble the Japanese use of the makiwara. This simple but effective training device was used in Okinawan Karate and may be of Chinese origin. 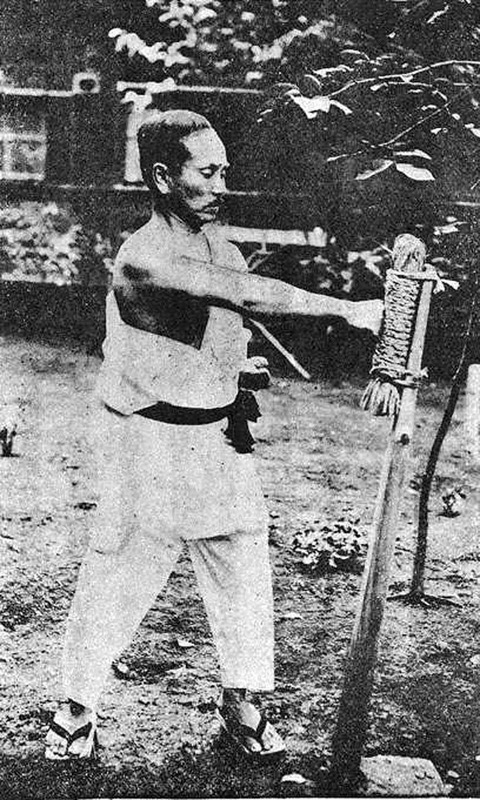 Gichin Funakoshi, one of the founders of modern Karate, using the makiwara. 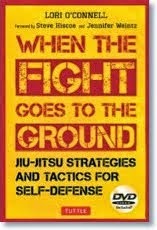 Simple striking dummies such as this one are fairly common throughout the martial arts. More rarely Bagua schools might employ a pole with four arms radiating out from the top in the form of a cross. These objects are struck in a free flowing way, and in that sense they are fairly different from the more rigorous set dummy forms that are practiced by folk styles further to the south. The emphasis here appears to be on both conditioning and the initial approach of the target. 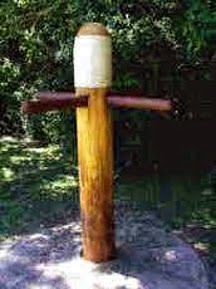 A simple striking dummy employed in some Bagua schools. Not only do striking dummies become more common as one travels further south but, in the modern era at least, they also seem to become markedly more complex. 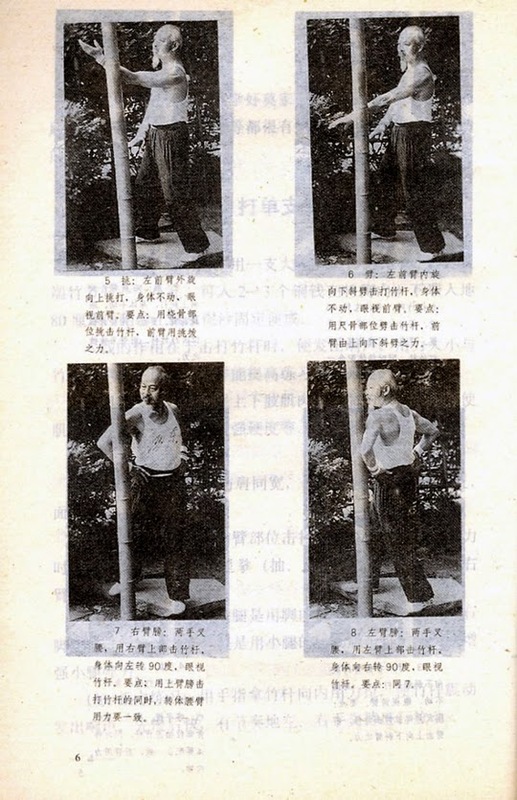 R. W. Smith, who studied various forms of Chinese boxing in Taiwan during his tenure there as a CIA officer in the 1960s, noted the use of dummies among some of his informants and provided helpful photographs. His first photograph is of Tung Chin-tsan (aka, the “Golden Dragon”) whom Smith first met on his tour of Southern Taiwan (Chiayi) in 1961. Tung was a somewhat unreliable source. He claimed a great martial heritage, having studied at Wudang, the Shaolin Temple in Henan (where he learned Plum Blossom Boxing) and the southern Shaolin Temple in Fujian. Given that scholars are now agreed that this last school never actually existed one must also doubt his other credentials. What Smith did know through his law enforcement contacts was that Tung had a number of followers in the Black Dragon organized crime society. He had also been imprisoned because of his own membership in the group. While Smith found his Judo and boxing average at best, Tung Chin-tsan truly excelled in the realm of dummy work and Smith came away quite impressed. So much so that he commissioned a replica of Tung’s dummy to be built at his own residence. 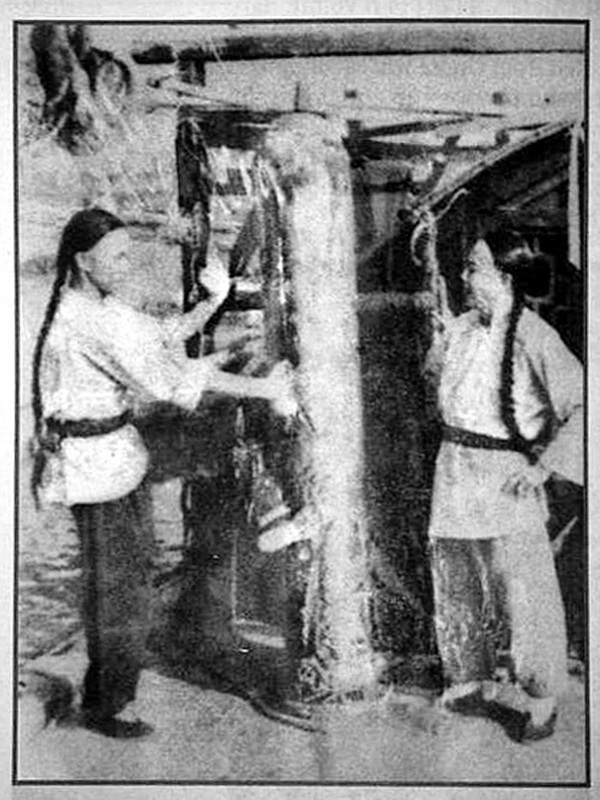 A few days later in Tainan, Smith was introduced to someone who actually was trained in Fujian. Wu Ku-Ts’ai studied in Yong Chun County (Wing Chun in Cantonese). Smith states that his style was simply “Shaolin.” Evidently Wu was a believer in the importance of physical conditioning. His students (all family members) would practice strikes on the post pictured here. He also used iron balls (for hand strength) and contact sparing to condition his students. It does not appear that Wu had a dedicated dummy form, at least not that he shared with Smith. As we travel further South we hit Guangdong Province. Many of the schools here have adopted various sorts of dummies into their practice. Further, the actual use of the dummy is more likely to be systematized into a complex, even theoretical form, rather than a simple conditioning exercise. Some of the first references that we have to dummies in southern China actually date back to the Cantonese Opera tradition. We know for instance that members of the various opera groups used wooden dummies in training their younger members in the martial arts. The Foshan Opera museum has a planted dummy (bottom half buried in the ground) that they claim is representative of what was often used. However, this dummy is so similar in both size and shape to the sort favored by modern Wing Chun and Hung Gar players that it is hard to tell how authentic it actually is. Period photographs of opera singers in training appear to show a much larger dummy and greater variability in the types of dummies used. Late 19th century performers with a large wooden dummy, apparently on the deck of a boat. Throughout the late 19th and early 20th century Choy Li Fut was the numerically and socially dominant martial art throughout the Pearl River delta marketplace. Like Tung they seemed to favor more “mechanical” dummies. There is also a lot of diversity in the sorts of training equipment that is seen in Choy Li Fut schools and this applied to their dummies as well. Very often dummies from this style will have one upper arm that is either weighted, or attached to a spring (a more recent addition) that can be manipulated by the student. 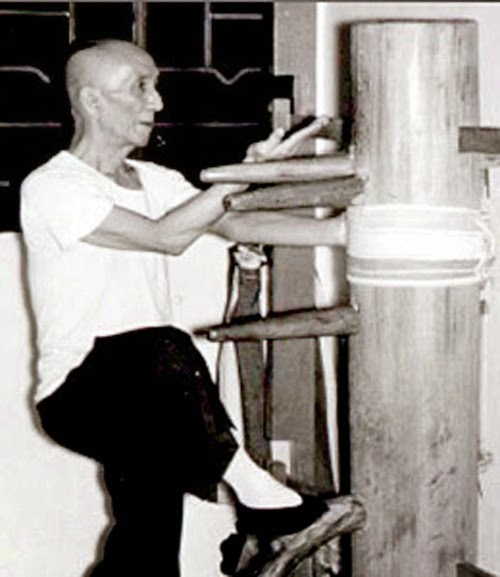 Master Ho Ngau working on a type of dummy still seen in Choy Li Fut schools. Traditionally striking dummies in Guangdong were planted in the ground. However, unlike the plum blossom poles, which were supposed to be firm and unmoving, a dummy that is intended to be hit should have a little movement and spring. As such dummies were placed in a hole and then secured with gravel, reeds or small shoots of bamboo so that it would have some natural springiness when struck. Other regional styles also employed dummies. Mok Gar seems to have favored a relatively simple striking pole, similar to what we already saw in Northern China. Hung Gar and Wing Chun seemed to take a middle position. Their dummies were more complex than the simple striking pole, possessing arms (usually three) and often a leg (one or none), but they lacked the more complex mechanics and moving parts favored by other regional practitioners. Rather than being strength training and conditioning devices, the dummies favored by these schools were meant to correct a student’s angles of attack and entry. They were always more concerned with geometry, posture and proper technique than strength. Traditional Mok Gar dummy training from Guangdong. Note the emphasis on conditioning. 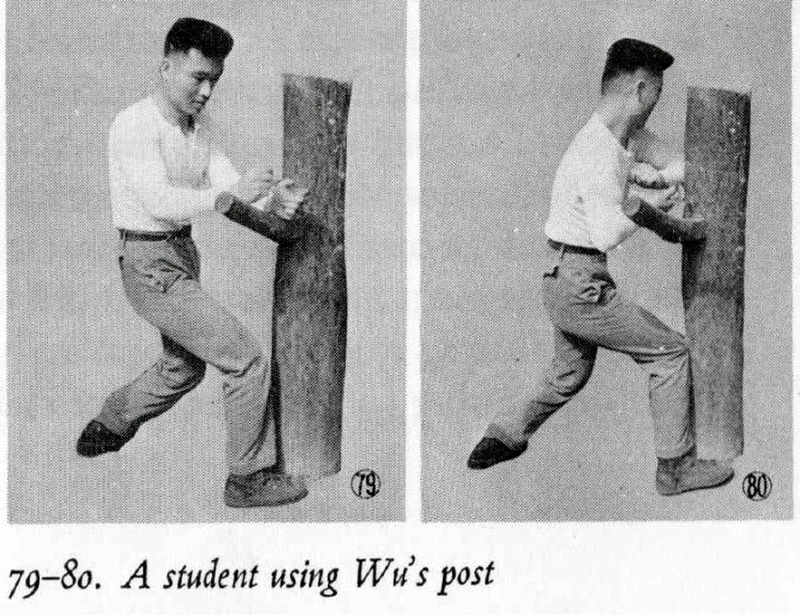 THE ADVENT OF THE MODERN “WING CHUN” STYLE DUMMY. In the 1950s, a number of martial artists fled the communists on the mainland and settled in Hong Kong. Ip Man (a prominent Wing Chun instructor) was one of these. In 1952 he wished to resume teaching the styles wooden dummy form in his school. Unfortunately he lived in a multistory apartment building and it was impossible to install a standard planted dummy. After thinking the matter over he asked a friend, Fung Shek, who was a talented carpenter to create a system whereby a dummy could be mounted on a wall. Fung devised a system whereby the dummy is held in place by thin wood slats that act as natural springs giving the dummy more life and movement when struck than was ever achieved with traditional “planted” dummies. Unfortunately Fung was not able to supply the Wing Chun clan with many dummies. After making less than a dozen dummies his son was killed in a tragic car accident. Most respectable citizens of Hong Kong took a rather dim view of the martial arts in the 1950s. These pursuits tended to be associated with criminal and youth delinquency. Evidently Fung felt conflicted about his association with Ip Man and concluded that the death of his son was divine retribution for creating devices that would train unreliable young men to better hurt one another, and other members of the community. While Fung stuck with his vow and never made another dummy, his basic design was adopted by others and is now produced on a massive scale (Ip Ching and Ron Heimberger. Mook Yan Jong Sum Fat. Springville, Utah: King Dragon Press. pp. 47-50). 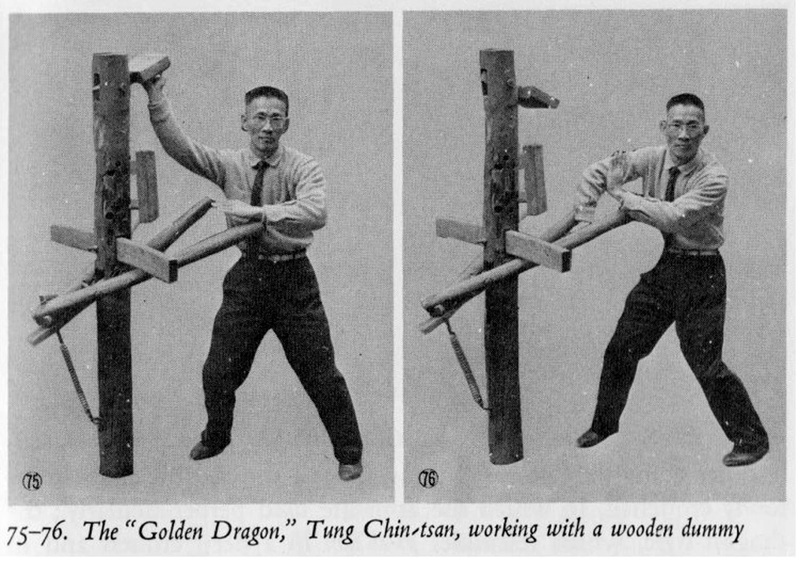 I mention this story not only as an interesting footnote in the modern history of the wooden dummy, but also because it nicely illustrates the ambiguous place that the martial arts occupy in modern Chinese society. Even after all of the work of the reformers in the Jingwu and Guoshu movements, the martial arts still engender a level of suspicion that students in the west have a hard time fully comprehending. Ip Man working on his dummy. Note the thin slats that dummy hangs on. This mounting system was perfected by Fung. Fung’s new mounting system has succeeded because it is ideal for urban environments. It was portable and could be easily installed in apartment buildings. Students responded enthusiastically to then new training tool and for the chance to work with dummies in an urban environment. As a result the standard Wing Chun dummy, modeled on the one commissioned by Ip Man and produced by Fung, has become the most common wooden dummy seen throughout southern China. This is the type of striking dummy that most martial artists will picture in their minds unless you specifically specify a different variant. 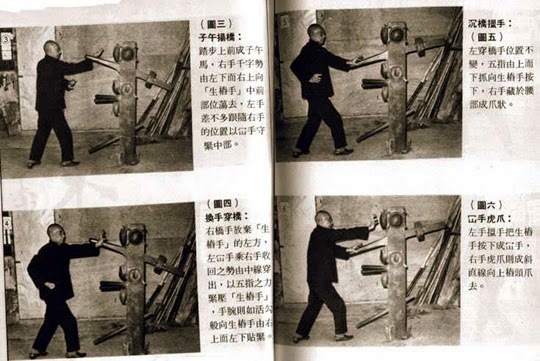 Further, the rising visibility of Wing Chun (due to the media presence of Bruce Lee and his teacher Ip Man) has led students in all sorts of styles to begin to experiment with different sorts of dummy exercises. I think we can safely say that there are vastly more wooden dummies in use in the Chinese martial arts now than there ever were in the 19th century. Further, they are more standardized in their size, shape and function than ever before. Thank you, Ben, for this very informative article. I strongly urge readers to visit the Kung Fu Tea site. 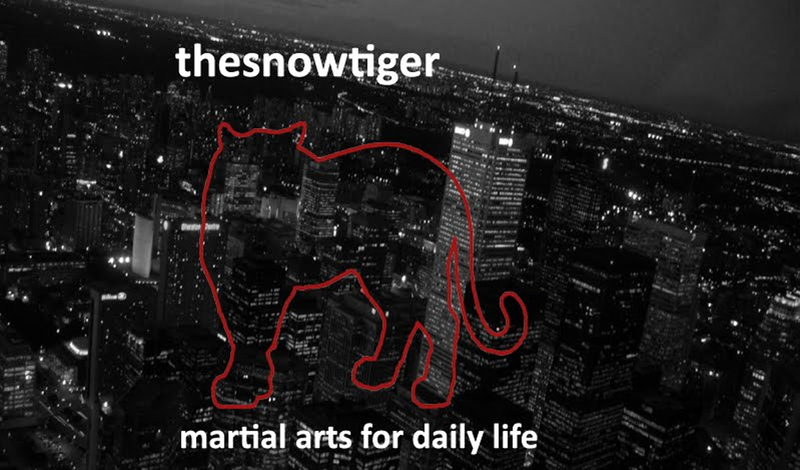 You’ll discover tons of information, all thoroughly researched, about the martial arts. Hopefully, Ben will do some more guest posts for us in the future.